When Kerosene lamps became popular in the homes of the wealthy in the early 19th century, dinner time was pushed fashionably later for Britain’s elite, a privilege to eat even after the sun had gone down. That, however, led to a first world problem. What to do between the main meals of breakfast and dinner? First world problems demanded first world solutions. 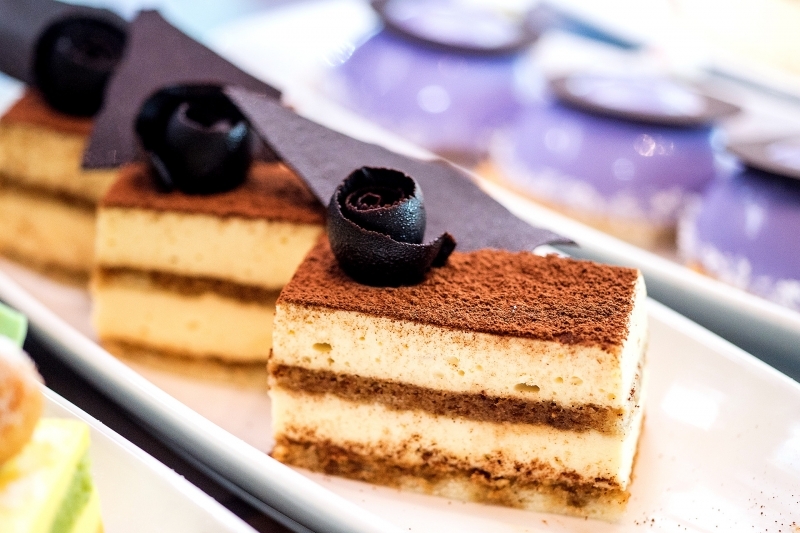 In the mid-1800s, the enterprising Duchess of Bedford introduced a late afternoon snack to chase away her “sinking feeling” between meals, and “high tea” was born, blossoming into a quintessentially British social occasion. 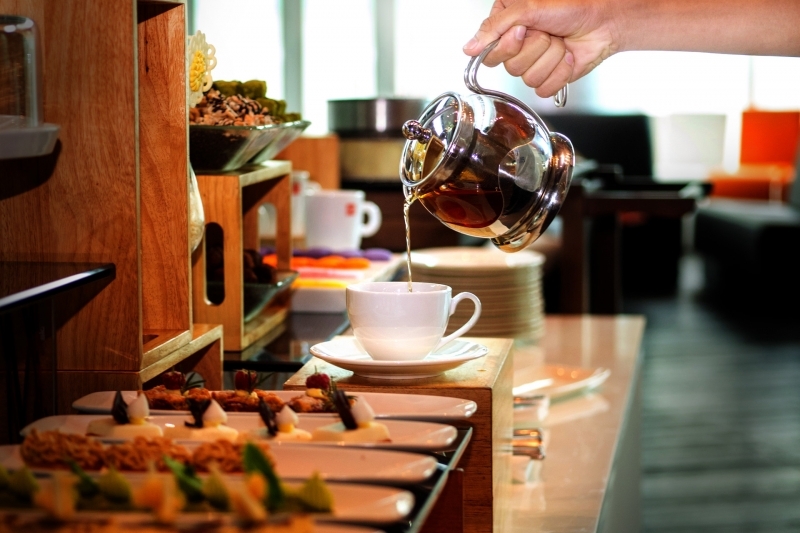 Leave it to the French, though, to popularize a British invention, as Le Méridien Saigon introduces “Bubbly Saturday,” superbly priced at just VND600,000++ for two, including free flow of specialty coffees, premium teas and a three-hour sweet and savory buffet. Better yet, your pocket won’t even miss the extra VND125,000 for a free flow of sparkling Prosecco, an upgrade the Duchess herself would wholeheartedly embrace. 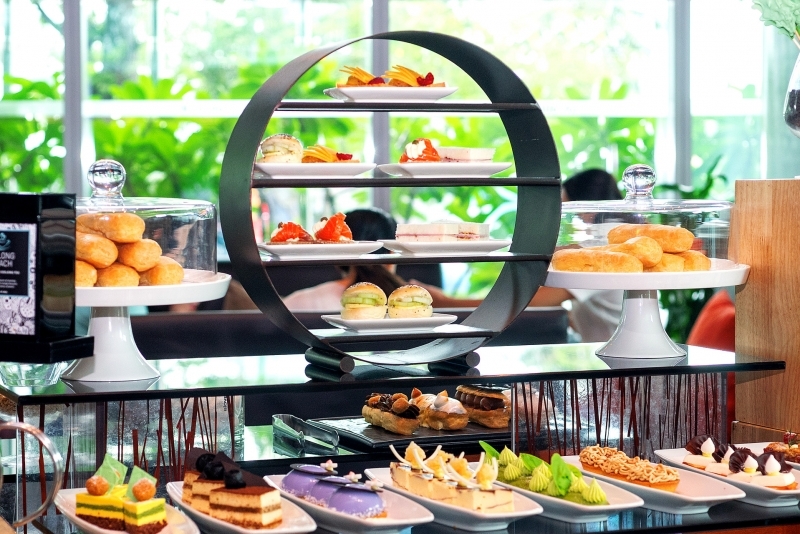 Easily the best value high tea in town, the French chain is out to make a decidedly 1% experience accessible to the 99. While there are many forms of high tea (in itself a misnomer, as “high” tea originally referred to the high dining tables where a heavier meal was eaten by the working class, whereas “low” tea was actually the more dainty tea ritual served on low tables in the withdrawing room), they all involve tea and scones and Le Méridien Saigon does both beautifully. The tea is premium Ronnefeldt, established in 1823, predating the venerable Duchess of Bedford herself. Tea lovers can select from eight loose leaf teas, representing a veritable global journey with Spring Darjeeling from the southern slopes of the Himalayas, Vanilla Rooibos from South Africa and Indian Masala Chai. I opt for the Le Méridien blend, a heavenly floral concoction that whisks me straight to the lavender fields of southern France, raised pinky finger optional. “Tea”tolers can opt instead for any of the coffees on the menu, including espresso doppio, cappuccino, and frappe cookie (a double illy espresso blended with honeycomb ice cream and homemade cookies). There’s also a DIY hot chocolate stand, with chocolate coins (white and dark) and a host of powders (cocoa, matcha and cinnamon). Seeing me fumble at the seemingly idiot-proof induction cooktop, a helpful barista sped over to whip me up a frothing cup of decadent hot chocolate (melted dark chocolate coins with a pinch of cinnamon), my second, but definitely not last, drink of the afternoon. The second necessary component of any self-respecting teatime is scones—rich and crumbly thanks to cold fat and working the dough as little as possible. I try both the regular and blueberry scones, topped with a generous dollop of sweetened cream and an even more gener- ous helping of the homemade jams. While the fruity grape and tart passionfruit were very good, it was the orange jam, lumpy with peel and spices, that was the standout. Le Méridien Saigon’s high tea is served in the Latitude 10 coffee lounge, a stylish industrial space heavy on clean lines and tones of cold grey (seriously, it’s very cold because it’s just off the lobby, so bring a cover up), made warmer by wood floors, pops of orange, and wraparound windows looking out over the Ba Son Shipyard. Seating is arranged in clusters around low tables and ottomans, leaning more towards business meeting chic than hipster living room. The food is most definitely Instagram-worthy, starting with the matcha madeleine topped with matcha cream and a fresh raspberry, the contrasting greens and reds sure to light up any Instagram feed. Equally easy on the eyes was the chocolate mousse cake, with its glossy dark chocolate shell topped with a white chocolate heart, and the matcha citrus, a pillow of mango-infused cream on a spongy green tea base. 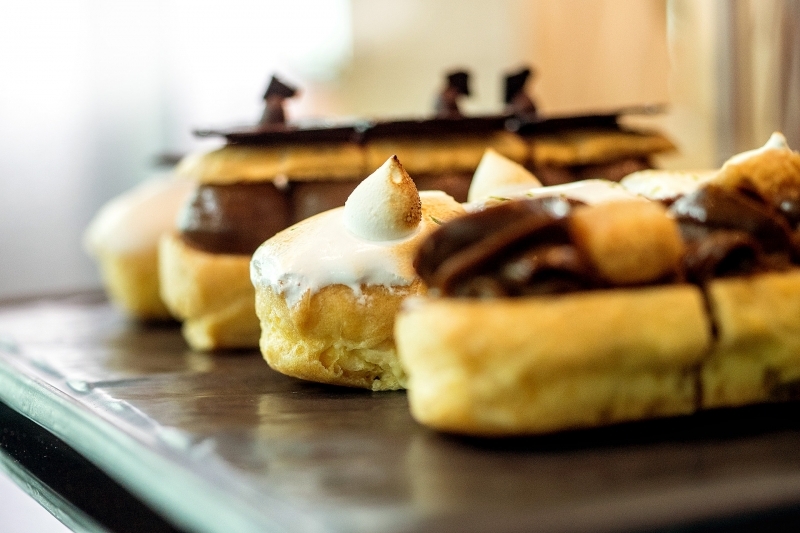 The French flair of the hotel came through fabulously in the assortment of colorful macaroons and signature eclairs, ranging from classic vanilla to the praline-filled Paris-Brest to the toasted Lime & Lemongrass. Additional toppings of marshmallows and chocolate were available in case guests felt the urge to Julia Child their way to their own creation. Unlimited savory bites were also on offer, ranging from ham and cheese sandwiches (crusts removed, natu- rally) and panini with grilled vegetables to smoked salm- on on brioche and a delicious cheese with rustic apple compote served on a raucously orange carrot bread. By the end of the afternoon, I attempt to rouse my- self from the best self-induced sugar-and-caffeine coma ever, and head out to the fading Saigon light, having thoroughly indulged in one of Britain’s best gifts to the world this side of Harry Potter and fish ‘n chips. 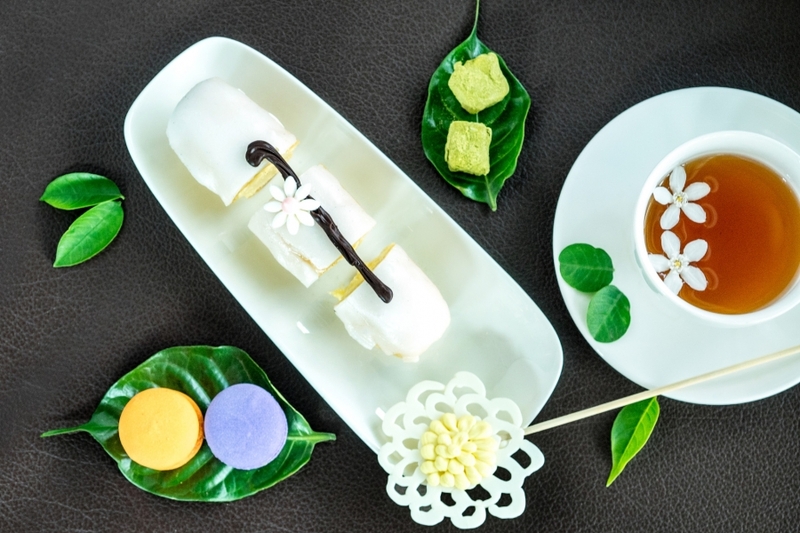 Le Méridien Saigon serves high tea daily from 2-5pm (VND290,000++ per person, VND450,000++ for 2) with a special Bubbly Saturday high tea buffet (VND600,000++ for 2 people, VND725,000++ for 2 including free flow of Prosecco). Menu items change regularly.